“Ivory Sky,” the words that owner and founder Allen Ross spoke to his best friend and co- founder Michael Thomas when describing the effects of synesthesia when playing the F-sharp minor 11th chord on a piano in 2007. Allen and Mike were building their arsenal of music compositions in order to land commercial and promotional licensing deals. Ivory Sky Music went on to work with many California Bay Area recording artists and companies including AT&T, Verizon Wireless, Toyota, and more. Ivory Sky Music became Ivory Sky Media in early 2013 when Allen decided to begin providing video content along with musical content. The company worked as “ghost editors” under other production companies, lightening the load of edits that needed to be delivered in short timeframes. Building upon an editing foundation Ivory Sky began working directly with wedding and live event clients to provide videography and photography services. In 2014 Ivory Sky began working with technology companies like Nimble Storage, Gigamon, and others to provide video content in marketing, human resources, product, live event/conferencing, and more. Expanding over the course of the next few years, Ivory Sky has worked with high schools, colleges and universities, small businesses, large companies, crowd-funding, private clients, industry professionals, retail facilities, and more. Ivory Sky is made up of diverse creatives whose goal is to turn every idea into a high quality visual product that evokes emotion from every viewer. A good team is just as important as any other part of a company, which is why we pride ourselves in being a young, forward-thinking collection of individuals. By bringing in creative and skilled minds from all around the San Francisco Bay Area with different backgrounds, it allows us to have the widest range of understanding. Not only is each team member talented and skilled in the technical, but he or she is also open and inviting in the personal. Whether it's the first or the tenth time working with a client, our team's shared desire on every shoot is to make you feel relaxed and confident. audio is a must, which is why we use high quality microphones and digital recorders to make your audio free of any distractions. Tripods, monopods, handheld and body mounted gimbals, and drones allow us to get the perfect shot on any production. Once the shoot is done, all the footage, audio, or photos are all backed up in multiple locations. From there our editors use high speed systems to cut and edit together your project to fit your needs. 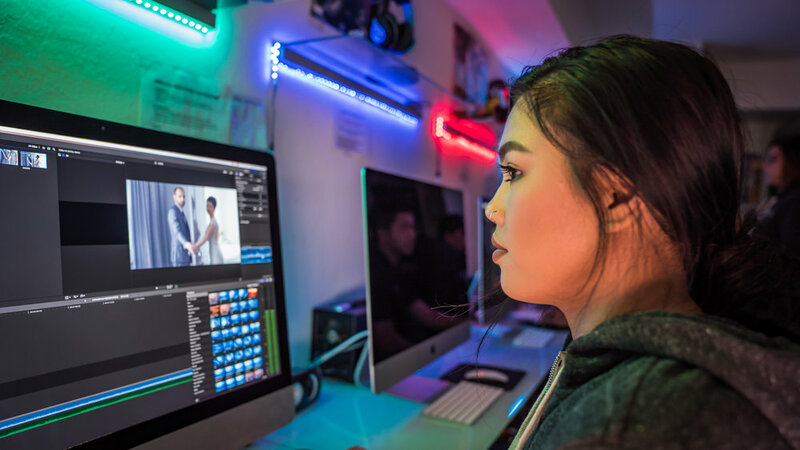 We edit video with Final Cut Pro X and photos with Adobe Lightroom along with many other tools and resources to bring together exactly what you are paying for. This includes adding incredible effects between two or more clips, removing the rustle of a mic on a shirt, creating an intro sequence for a series of videos, cutting out those little mistakes during the middle of a sentence during an interview, and much more. After we color correct the images on calibrated displays, we export the finalized files and upload them online for private or public use in which you own all the final rights. If the above sounds like a team you'd like to work with send us an email! We love working with new companies and helping them reach their goals. We also do weddings and other live events! Check us out over here.